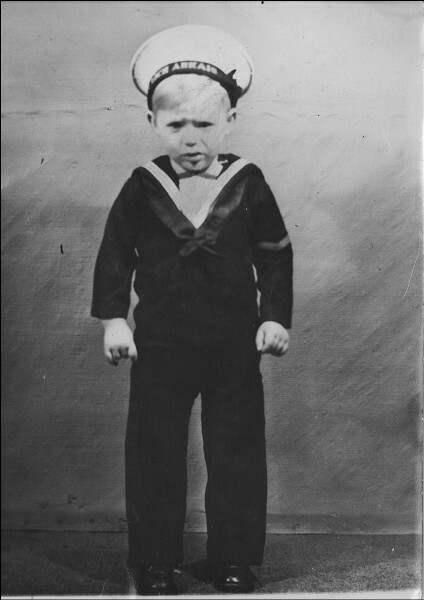 This photo of the little "tough nut" sailor is one of me taken Aged 3 at my Granda and Granny's house (Sandy and Nellie Fraser) at Inverbreakie Farm in 1952. My mother and father were obviously preparing me for life in the Royal Navy, following in the footsteps of my father Sandy Fraser, his brother Tommy Fraser and sister Cathie Rose (nee Fraser), who all served in the Royal Navy. Although I did apply and was accepted for the Navy in 1964, I chickened-out at the last minute. John, this picture should have been a clue that you would be destined to spend part of your working life at sea, albeit on the rigs and not ships. I was up in Invergordon a few weeks ago for my daughters wedding, the reception was in the pavillion at Strathpeffer and the memories of the nights we had there in the sixties came flooding back. Hope all well with you. Norley. Norley, I have just seen your comment. We had some great nights there. Triple Bacardi and cokes for me, you and Sandy were the standard order. Where are you living now. I am still in Ellon and have been back at Sparrows for the past 8.5 years. However, I am retiring on 29 March. I was going to wait until my 70th birthday on 01 July, but I have had enough now. I would love to meet up with you at some stage. Remember the Hillman Imp what was it C615 or C516 was it. Can't believe it 50+ years ago. John, not much wrong with your memory after 54 years, it was 618C. I'm living down in Gatehouse of fleet so County games away to Queen of the south are now a 'home' game for me. I still get up to Inverg every few months to see the kids and grandkids and of course to visit my old pal Kenny to reminisce about cycling in years gone by. He is in Mull hall now.